There seemd to be a new build estate being constructed in almost every borough of Manchester at the moment. This is good news to us Aerial Fitters, because with new build properties the builder will more often then not refuse to install a TV aerial in the loft or anywhere else on the house, leaving it up to the new owners to sort out getting an aerial installer to come to the property and fit one, usually in the loft. 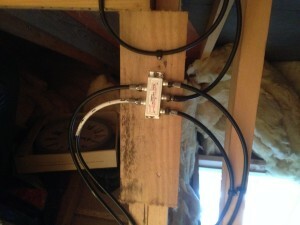 The builders will install TV points in the house, and the cable to these points will be coiled up together in the loft, near the loft hatch if your lucky. I recently went to one of these installs the other day. 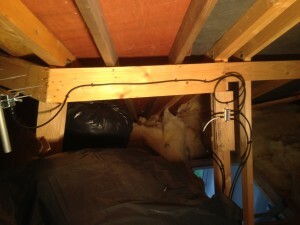 So I thought I would take some pictures and put them i a blog to show what to expect when fitting a loft aerial and also the type of aerial that you should go for. I nearly always use the log periodic aerial because it acts like a high gain aerial by drawing in good strong signal, but it doesn’t have a back reflector or ballun so picks up less noise and interference. 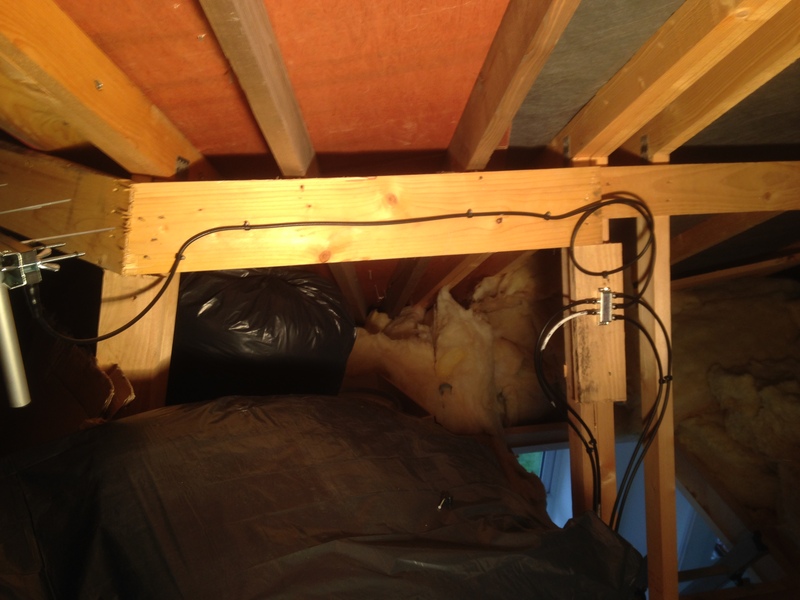 By putting an aerial in the loft, there can be issues with signal loss, because you can lose up to 50% of the signal by placing an aerial in a loft. If however you are in an area with a strong signal, it should work fine. You can then, depending on how many points you have to split to , install a passive splitter or use a masthead or set back amp to distribute the television signal. I always test the strength of the signal coming out of a passive splitter before using a powered amp, because like in this occasion I was able to line up the aerial to get a strong enough si gnal to split 5 ways as you can see in the image. The average cost for a set up like this is around £150 depending on other factors.